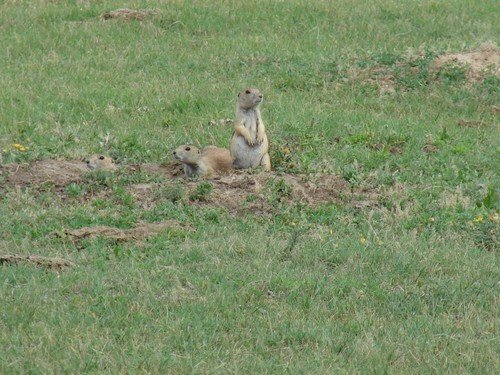 Prairie dog hunting can offer sportsmen hours of practice and entertainment. Shooting distances can vary depending on weather conditions so plan accordingly to the weather. Prairie dogs are small targets and will stand still, many can give you a few opportunities. Our clients have been known to shoot 500 plus rounds per person per day! However, some days clients shoot less than 100 rounds per person. Regardless, hunting prairie dog in South Dakota is a great opportunity to sharpen skills. Any rifle is acceptable. We recommend 2 rifles per prairie dog hunter to prevent barrels from overheating. While any firearm will work, we recommend a .223 or a .243 centerfire caliber as your rifle. Each hunt includes one-night lodging at the beautiful and scenic Diamond A Ranch in Gregory South Dakota. We will provide meals and beverages, however, if clients want alcoholic beverages we ask you to bring those with. There is no drinking while in the fields, however, clients are more than welcome to sit back at the lodge after shooting to enjoy the view. We will provide transportation to and from the prairie dog hunting fields along with water and bag lunches for you to enjoy while shooting. We have portable shooting stations and sandbags available. If clients wish to bring their own that is alright as well.